The Seth Cole Premium Paper For Pens Pad features a super smooth and hard surface that is perfect for all fine pen and ink works. It contains 40 sheets of opaque premium drawing paper suitable for technical and calligraphy pens. Each 80-pound bright white sheet resists bleeding and feathering to ensure convenient use and accurate drawings. Acid-free and non-wicking, the Seth Cole Premium Paper For Pens Pad provides works that will last for a long period of time. It comes with top tape to securely hold the sheets together. It offers two different sizes to accommodate most drawing and drafting applications. 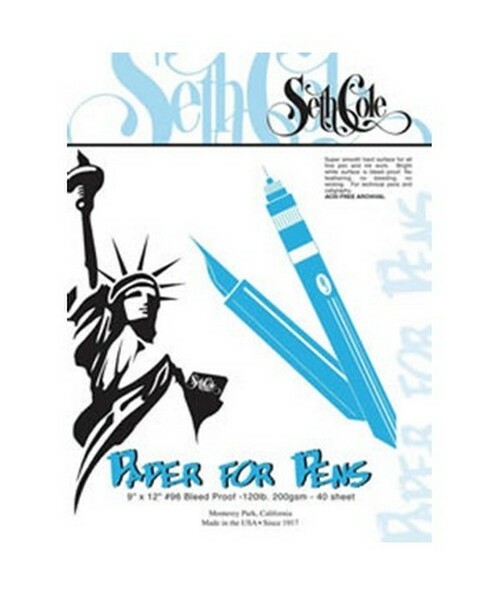 The Seth Cole Premium Paper For Pens Pad comes in two sizes. Please select your preference from the drop-down menu above.